Who are Casa of Oregon and ROC USA? Since its inception in 1988, CASA has focused on the development and rehabilitation of affordable housing for farm workers and other under-served populations throughout Oregon. CASA’s work in manufactured housing began with assistance to farmers in acquiring manufactured housing for their employees. In 2006, CASA was awarded a Corporation for Enterprise Development (CFED) Innovations in Manufactured Homes (I’M HOME) grant, with matching funding from Oregon Housing and Community Services. Under this program, CASA focused on furthering the mission of the I’m Home initiative. In May 2008, CASA became one a Certified Technical Assistance Provider (CTAP) with the national ROC USA® network. 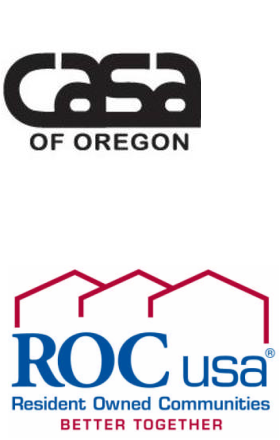 As a member of ROC USA Network, CASA delivers pre- and post-purchase technical assistance and training and assistance with securing financing to help manufactured homeowners in Oregon buy their communities. Visit www.casaoforegon.org/mhpp to learn more. Helps resident corporations buy their manufactured home communities or “mobile home parks” from private community owners. ROC USA is a non-profit organization with a mission of making quality resident ownership possible nationwide. We do this by first focusing on communities that are for sale and where homeowners have a strong likelihood of success if they choose to work as a group and buy it. We know that with opportunity, technical support, and financing, homeowner groups can buy, preserve and improve their communities. We know because we have helped more than 100 communities do just that!